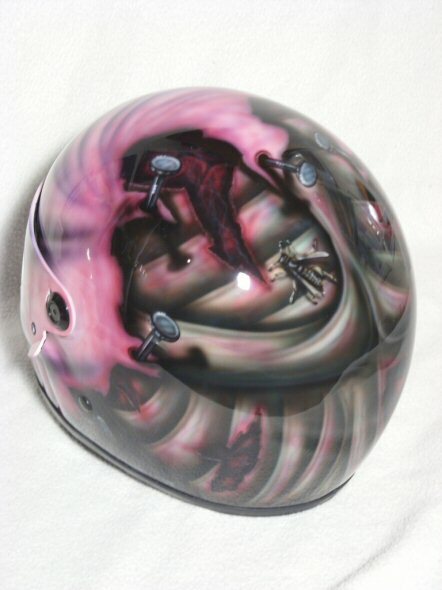 Joker themed helmet with multiple scenes from the Dark Knight movie. 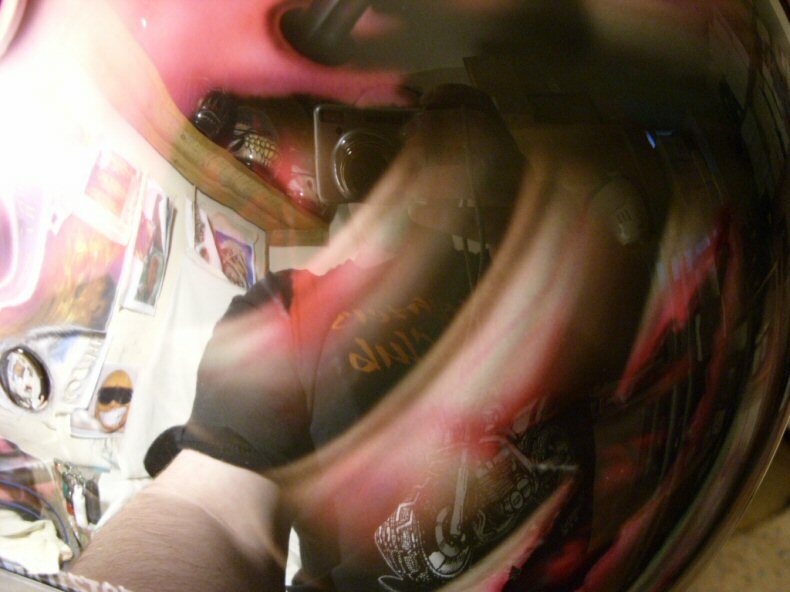 Very small scale portrait work and detailing throughout with murals blended and overlapped to form one wrap around image. 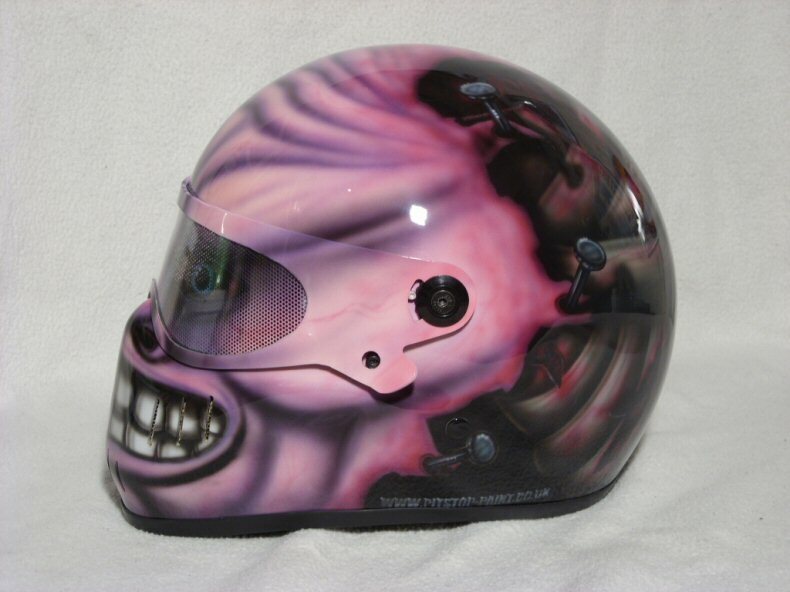 Joker face/mouth to front of helmet. 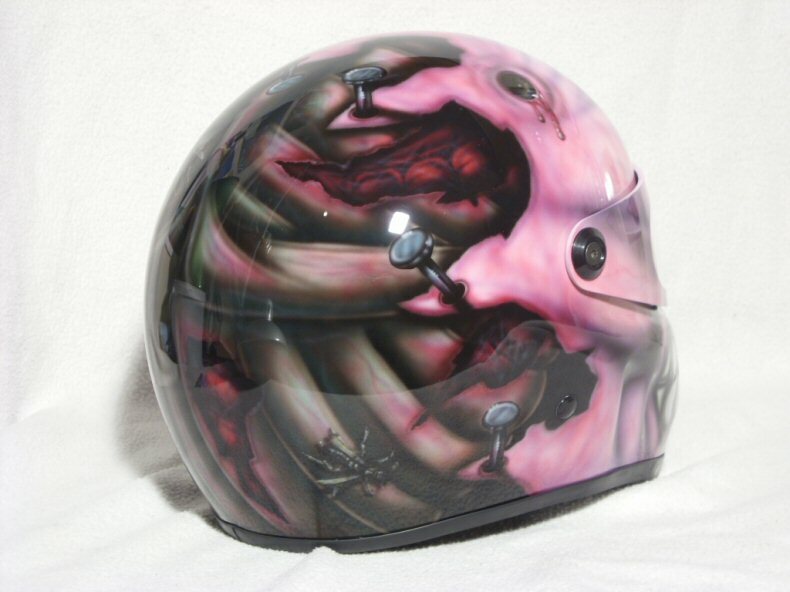 Huge amount of hours in this helmet hence the higher price. Simpler unique versions could be done for those on a budget. 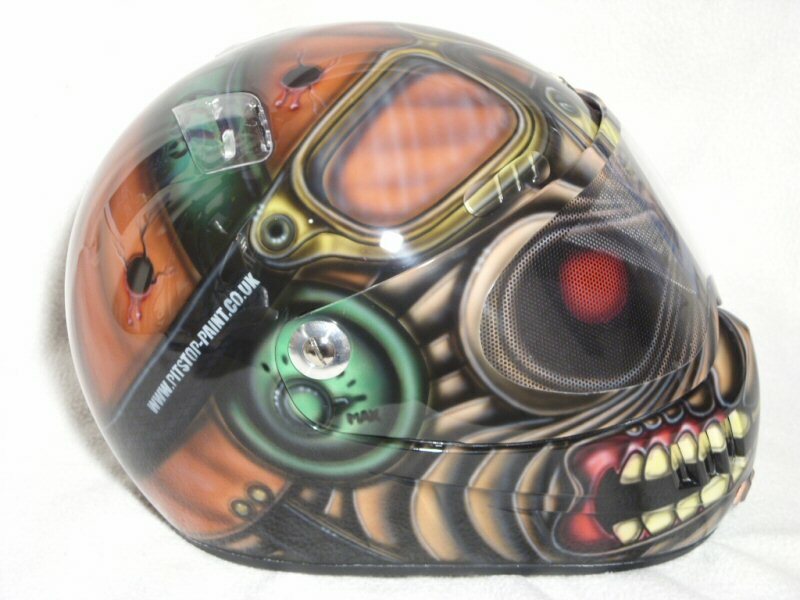 Smiley helmet with bio-mech style tribal design to match race leathers and bike. Guardians of the galaxy themed helmet featuring baby groot smiley face design to the front of the helmet and a very detailed Groot and Rocket character mural to the rear. Comic style teenage mutant hero turtles themed helmet featuring mottled skin texturing and big bold graphics. Comic style grinning devil design done in metallic blue base to match the bikes colours. Overlayed with candies, etc for a sublte skintone look. Blue candy ture fire to rear along with bikes logo. 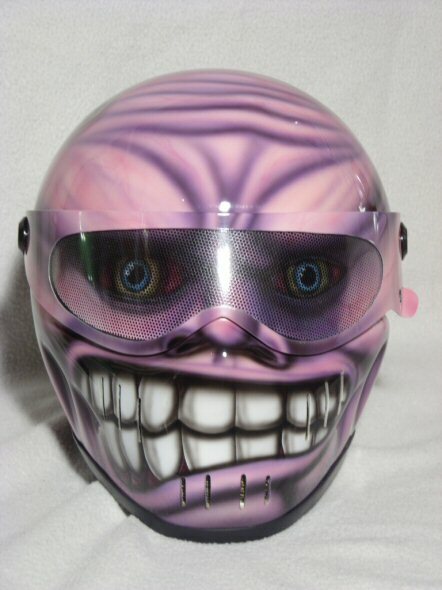 Comic style grin on a carbon fibre Bandit helmet. 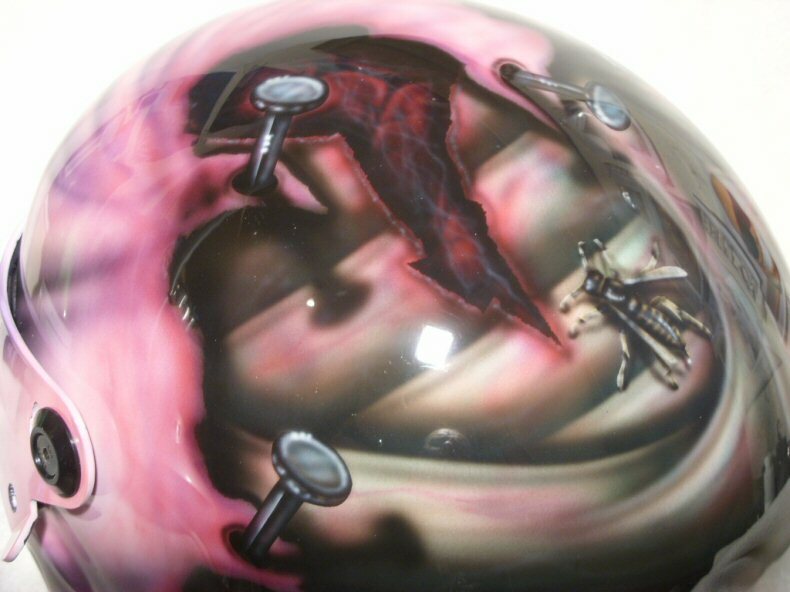 Similar to other designs Ive done, but allowing carbon weave to show through. Green spiderman logo to rear to finish it off. Design created from scratch by myself to customers outline ideas. 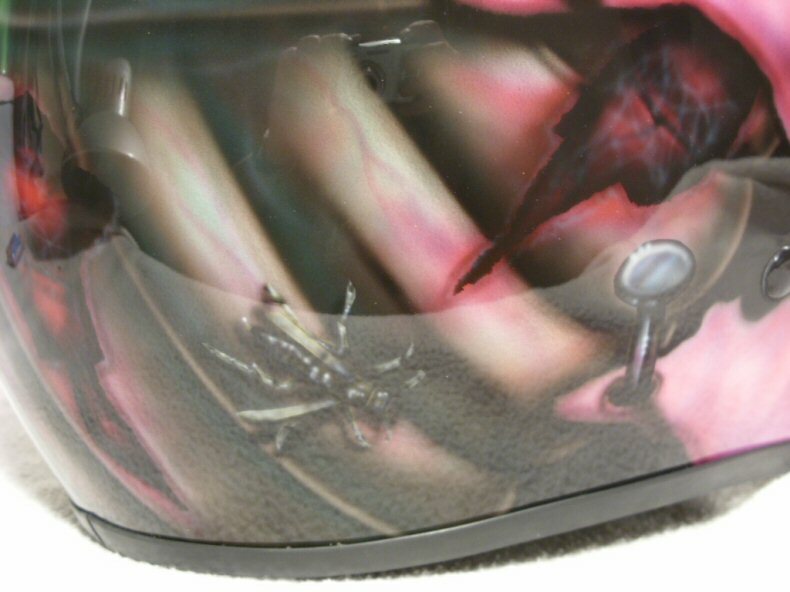 Smiley face design to front with race design graphics to match his R6 motorcycle. Mural to rear with kite surfing, bike stunting and drifting, etc. Lots of nice detailing throughout. 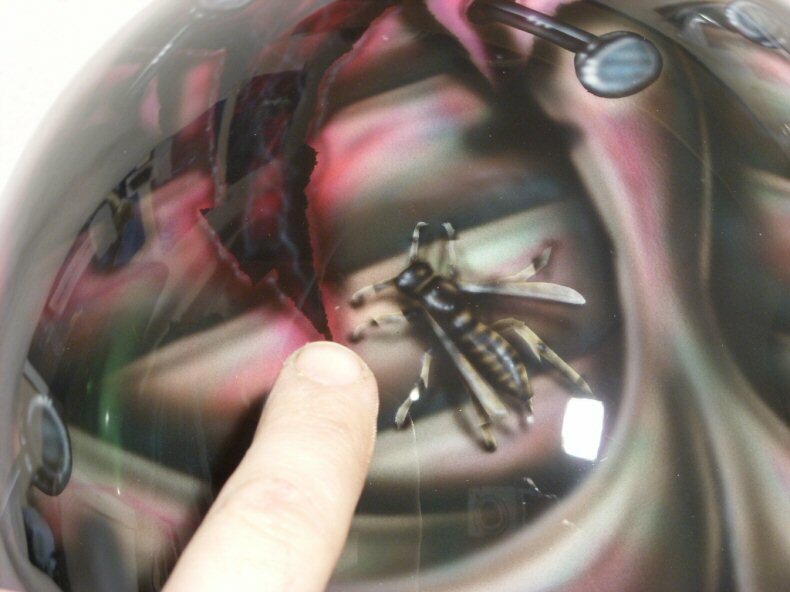 Comic style grin on a Bandit XXR helmet. Similar to other designs Ive done, but fairly restrained design. Loads of tiny detail work and neat logo to rear. Finished with black visor. 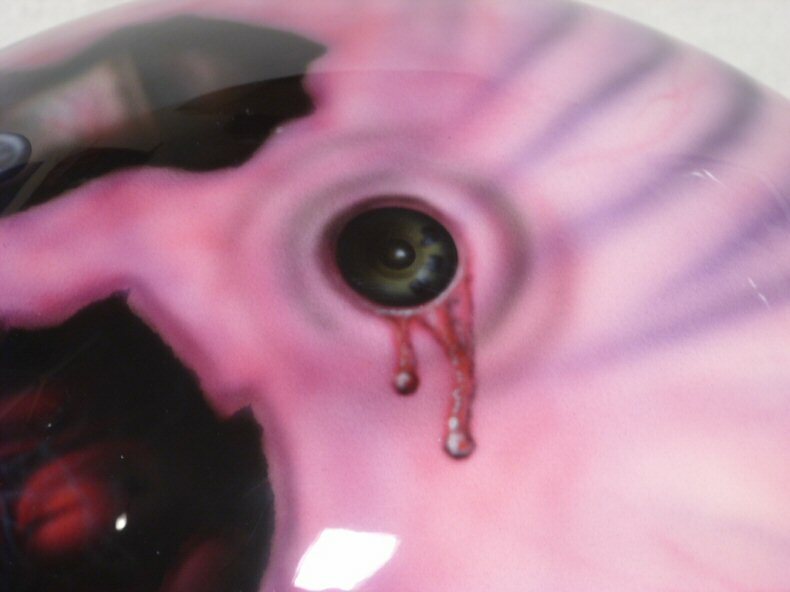 Comic style grin on one of my Streetfighter helmets. Similar to other designs Ive done, but done in vibrant red to match customers bike. Loads of tiny detail work including maggots, hooks and a realistic wasp. Finished with black visor. Design done to customers outline specification, based on existing `phil`s stretched face design. 3D nails holding face on with drop shadow detailing, etc. Micro scale detailed wasp, maggots, bullet hole, exposed brain, torn and blood stained wrinkled flesh, etc, etc. 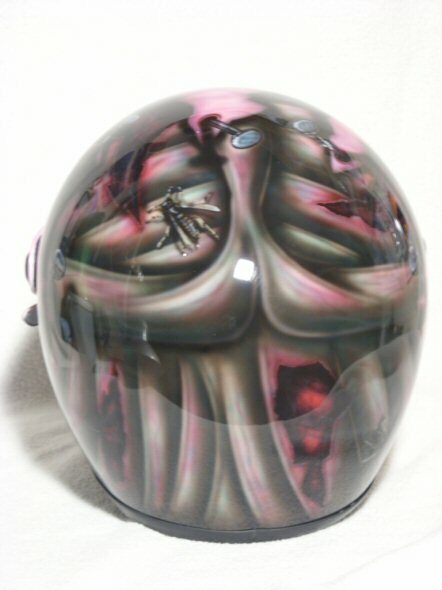 Special effect overkill and really evil looking helmet sure to cause a lot of double takes. Pictures speak more than words can. Have a look! Design done to match customers request incorporating brass touches and metallic silver to match his bikes theme. Lots of subtle detail throughout this show peice including bullet holes with deformed skin from theyre impact, blood trickles, veins, drop shadows where front mask passes over skin at rear, peircing bolts, etc, etc. 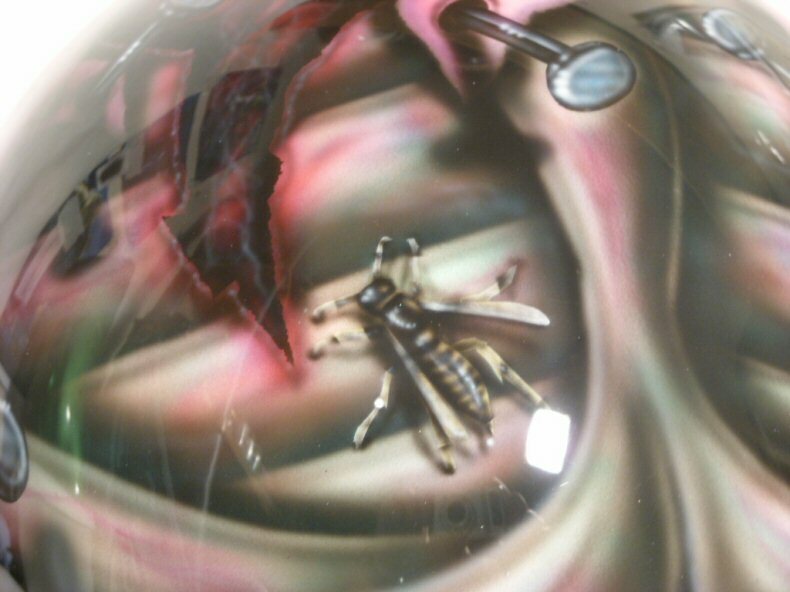 Awsome helmet with owners nickname to rear. Design done to customers outline specification, and the rest created from my imagination as went along. 3D nails holding face on with drop shadow detailing, etc. Micro scale detailed wasps, bullet hole, exposed brain, torn and blood stained wrinkled flesh, etc, etc. 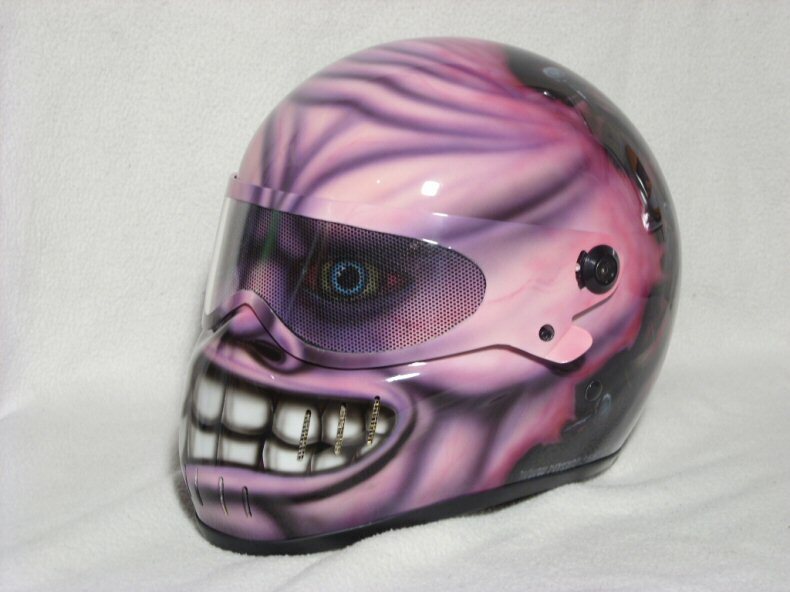 Special effect overkill and really evil looking helmet sure to cause a lot of double takes. Pictures speak more than words can. Have a look!